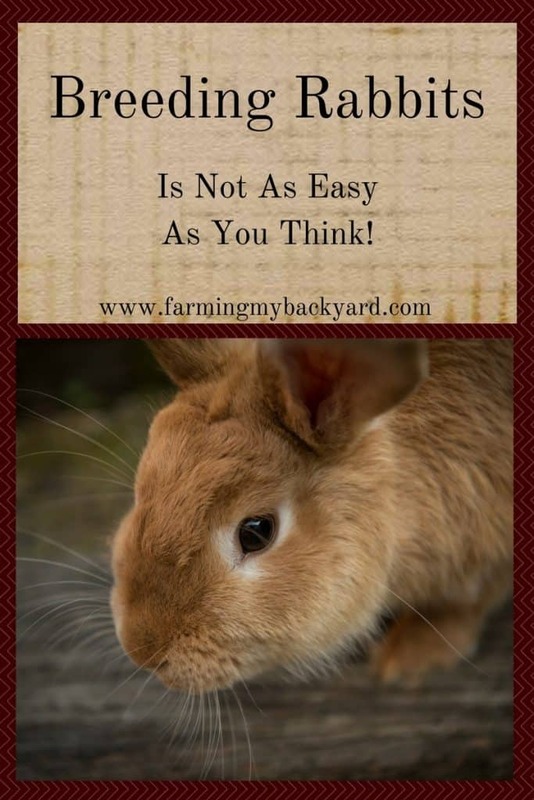 Breeding Rabbits Is Not As Easy As You Think! When people talk about something multiplying quickly they often say breeding like rabbits. When you first start breeding rabbits sometimes it can be a big surprise when your rabbits don’t breed like, well, rabbits. Turns out there are several things that can make your rabbits less likely to have a successful mating. Here’s how to start breeding your rabbits, and some of the reasons why it might not be working. When you want to breed your rabbits, put the female into the males cage. If the rabbits are housed separately, you ALWAYS bring the female to the male. Females can be really territorial and may attack the male instead of breeding. The two rabbits will probably run around in circles for a bit. If the female is open to being bred, she will lift up her tail, the male will mount her, and then he will fall off onto his side. The buck should do this a couple times before you should put the doe back in her space. You’ll want to watch the whole time, because it can be really quick and you might miss it and then be surprised in a month with babies. It’s a good idea to bring the doe back to the buck in about ten hours, as the act of breeding stimulates rabbit does to ovulate, so you will increase your chances of a decent sized litter if there is a second breeding. If the female never settles down, try again the next day. Rabbits don’t go into heat the way dogs and cats do, but they aren’t receptive to breeding 100% of the time. She just may not be interested on that particular day. If you’ve tried several days in a row, and she’s still not willing, there may be other issues at play. Why Won’t My Rabbits Breed? Being overweight is one of the biggest causes of infertility in rabbits. If your rabbits are a bit chubby, cut down on all the treats! Get them some more space to run around and exercise. Then try again when they’ve slimmed down a bit. Rabbits can be sensitive to day length (just like chickens!). If you get less than 12-14 hours of light, try adding some extra light in the rabbitry and see if that helps. First time does don’t always know what they’re supposed to do. Once they’ve been successfully bred they will tend to be eager to bred the next time unless you have very large spacings between your litters. Does in the wild can breed the same day they give birth, and baby rabbits wean at about 4 week old. Not all breeders practice such close spacing with their rabbits, but if you are having problems with no other apparent cause, it may be worth trying to breed more frequently. It’s also a good idea to know what to expect before the babies arrive, so feel free to check out our post How To Care For Baby Bunnies.